The IBM SmartCloud Application Collaborative Management Service backups your data once a day on a persistent disk located in the same data-center. This persistent disk is automatically generated when you enable the service. At service enablement time, you can choose also the time when the backup must be done. 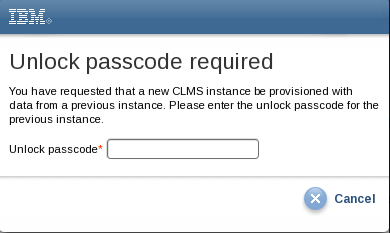 From the SCACLMS console (Manage->Data) and being logged as ‘Administrator’, you can verify when the last backup has been done and when the next backup will be taken. You can also edit the schedule by clicking on the ‘Edit Schedule’ hyperlink. This procedure will restore the data from the last automated backup!!! The data updated/created between the last backup and the restore date/time will be lost!!! To restore the data, you must log-on the SCE portal and select your SCACLMS service from the Control->Service instances panel. below you have to select ‘Restore Service Instance’. When you enabled the service, a pop-up appears with the unlock passcode. Make sure you have it before going forward!!! Once you click on restore, don’t close this page. Click ‘Ok’ and wait until the ‘Status’ is ‘Running’. 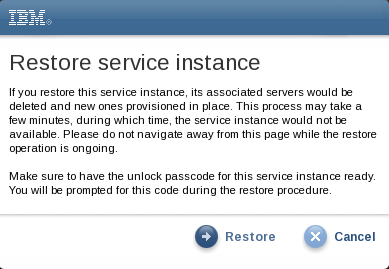 The service will be restored with the same IP address and hostname.